We design and distribute prizes both at home and on site. We partner with a marketing team to ensure branding and messaging is consistent and powerful. 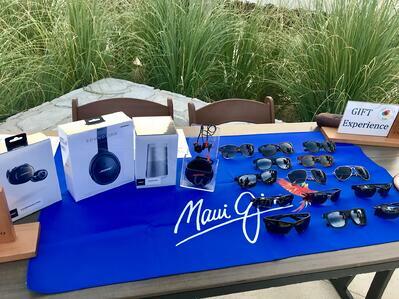 Our prize management specialty includes everything from crystal awards, VIP experiences (Bret Michaels Rockstar Suite experience), branded swag, nightly turn down gifts, on site event gifting (Maui Jim custom-fitting station, Bose experience, etc) and in-office event promotion. We help your team host monthly competitions for their incentive trip and also handle additional prize incentives throughout the year. This ranges from a sports ticket giveaway to a weekend away in the Caribbean, to a foursome at a golf course or a day at the spa for the company's top performers. This can even include branded gift cards for the most innovative marketer whose campaign drives the most leads. We work with you on your vision and what your company is trying to accomplish to create a customized branded promotion experience.